This article was written by James “Reaf” Miller. Want your article here? Give us an e-mail at anicomhivemind@gmail.com and this could be your piece! Big O is a mech Anime series with film noir trappings and heavy influences from the 90s Batman animated series. The plot takes place in Paradigm City forty years after everyone and everything lost their memories through unknown and mysterious circumstances. 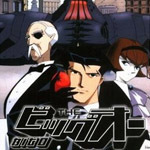 We follow Roger Smith, a top Negotiator for Paradigm City who negotiates for kidnapped girls or to pilot the titular giant robot, Big O, to fight various other robots and monsters. The series is largely episodic with some ongoing plots, including the mystery of why everyone lost their memories forty years ago. The characters are great and a lot of fun to watch. Steve Blum voices Roger Smith so you know to expect a cool and cocky character and Blum delivers. Assisting Roger is R. Dorothy Wayneright, an android, whose deadpan snarky attitude steals every scene and even gets the better of Roger at times. The supporting characters play off the two well and get fleshed out more as the series goes on. The animation is good and the style is reminiscent of 70s Anime mixed together with 90s Batman. While a bit stiff at times when the action starts and the giant robots appear all the stops are pulled out. The music is astounding, ranging from classical, to jazz, to something out of a film noir, all a joy to listen to. The music adds that extra layer of atmosphere to the series and helps make the setting a character onto itself. Overall the series is a good watch if you like giant robots, noir, or just some good ol’ episodic TV. The second half does let the series down a bit and isn’t that great compared to the first, but the ending is a kicker. Definitely a classic and well worth a watch.